Empty Boat was envisaged as a collective, a vessel of shared culture, ideas and beliefs. 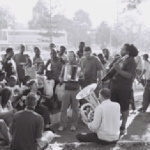 The band formed in 2004 when an unusual crew of professional musicians were brought together as part of an awareness raising campaign by Poo Productions. 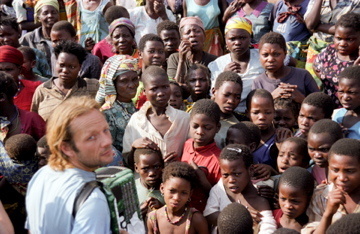 The 15 musicians and vocalists who were involved in the recording of Empty Boat's album Waitless are as eclectic as the sounds they have produced; they come from many disciplines and "have a taste for exotic and unlikely combinations" says Dean Brodrick the founder and composer of the band. Many of the artists, such as Brazilian singer Monica Vasconcelos and tuba and bass guitar player Gideon Juckes (Bellowhead) are established stars in their own right. Others, such as Dean's nine-year old daughter Madalaine, who sings the Amazonian tune Mamae Iemanja, are just embarking on their musical journey. Brodrick's influences are far-reaching and his interest in musical forms knows no boundaries. The music transcends genre and resounds with many different voices including birdsong and the innocent voice of a child. The crafted compositions are awash with spontaneity propelled by African and Brazilian rhythms, moist with unusual and exotic sonorities and harmonies, splashing with enthusiasm and positivity. The eclectic parts are cooked into a unique coherent and satisfying whole. 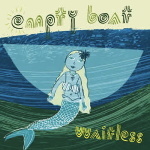 Empty Boat released their album Waitless on 27 October 2008 in association with Pump Aid (official release date 27 October, distribution by Harmonia Mundi). It will raise funds for Pump Aid's African sanitation projects; for every album sold, pound1 will go to the charity Pump Aid to provide sanitation for LIFE to one person.